Shaorong Deng gets an experimental treatment for cancer of the esophagus that uses his own immune system cells. They have been genetically modified with the gene-editing technique known as CRISPR. 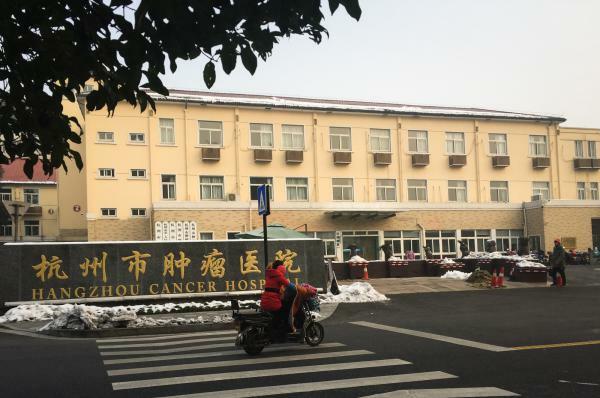 The Hangzhou Cancer Hospital in Hangzhou, China, is forging ahead with CRISPR treatment for cancer. "If they have not received this treatment they will die — most of them will die in three to six months," says Dr. Shixiu Wu. 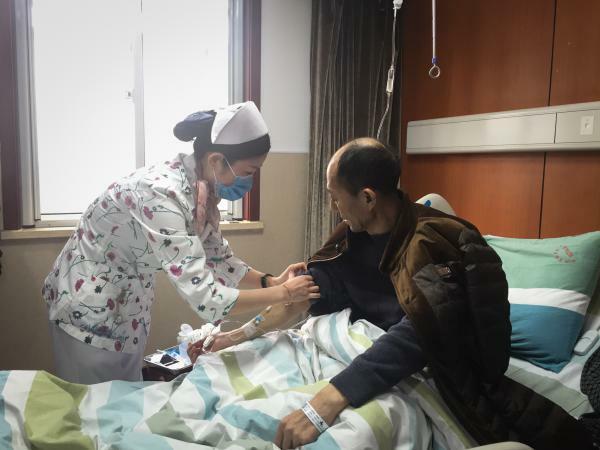 Shaorong Deng is sitting up in bed at the Hangzhou Cancer Hospital waiting for his doctor. Thin and frail, the 53-year-old construction worker's coat drapes around his shoulders to protect against the chilly air. Deng has advanced cancer of the esophagus, a common form of cancer in China. He went through radiation and chemotherapy, but the cancer kept spreading. Now he's back at the hospital to get an experimental treatment. It involves using cells from his own immune system, known as T cells, after they have been taken out of his body and genetically altered in a lab by the gene-editing tool called CRISPR. "I consider myself very lucky," Deng says through an interpreter as a nurse finishes taking his blood pressure. Just then, the door swings open, and the nurse rushes back in. She's cradling a clear plastic pouch filled with yellowish fluid. She hangs the pouch above Deng's bed, attaches one end of an intravenous tube to the bottom, and slides a long needle at the other end into Deng's arm. "This is the T-cell infusion," says Dr. Shixiu Wu, who's president of the cancer hospital in Hangzhou, a little over 100 miles southwest of Shanghai. "Now it begins — getting the immune cell therapy." Deng stares at the IV as millions of genetically modified immune system cells slowly drip into his body. The infusion will take at least an hour. "I can only hope it will completely — completely — get rid of the cancer," Deng says. Deng is participating in what Wu says is the most advanced study in China testing CRISPR in sick people. But at least eight other Chinese studies of CRISPR for various forms of cancer are listed on a U.S. government website that serves as a clearinghouse for biomedical research worldwide. The list includes studies of CRISPR as a treatment for cancers of the lung, bladder, cervix and prostate. In contrast, only one CRISPR cancer study has been approved in the United States, and it's only just now starting to look for the first patient to treat. "China is starting to pull ahead of other parts of the world — maybe for the time — in regards to biomedicine," says Hallam Stevens, an anthropologist at the Nanyang Technological University in Singapore who studies Chinese bioscience. "They've been really investing heavily in it over the last couple of decades and it's starting to pay off in a big way." The treatment Wu is testing involves taking a sample of blood from each patient. A lab at a biotech company two hours away by bullet train extracts T cells from the blood. Scientists then use CRISPR to knock out a gene in the T cells known as PD-1. This engineering feat modifies the T cells so that they zero in on and attack the cancer cells, once they're infused back into each patient. Deng was returning to the hospital to receive his second infusion of gene-edited T cells. When he first arrived at the hospital about a month ago, he was so weak he needed a wheelchair. But Deng says he started feeling better soon after his first infusion. "I feel very stable," Deng says. "I was weak in the limbs before and now I am not weak anymore." It's still too early to draw firm conclusions about how effective the treatment will be or what the full extent of side effects from it. Deng is one of just 21 patients with advanced, incurable cancer of the esophagus that Wu has treated so far with CRISPR-edited T cells. But Wu says about 40 percent of the patients appear to have responded. One patient is still alive almost a year later. There's no randomized comparison group in this study. But usually, such patients would have no hope, Wu says. "If they have not received this treatment they will die — most of them will die in three to six months," he says. Wu says he's writing up the results for a scientific publication, but these results have not yet been peer-reviewed or published. So far, Wu says the only side effects have been mostly minor — an occasional fever or rash. Nine patients in the study have died, but Wu says that was from their cancer, not the treatment. One patient discontinued treatment because of a high fever. The rest appear to be stable or in "partial remission," Wu says. They are undergoing monthly treatments. "As a cancer doctor, you see many deaths," Wu says. "So it's good to be part of this." "China sees biomedicine as one way it can compete with the West and show off its technological prowess and scientific chops in the 21st century," Stevens says. "It's also something that's going to be critical for keeping China's population healthy in the 21st century." In general, medical research in China isn't as stringently regulated as in the West, Stevens says. "It begins at a different starting point," he says. In the West, there is a history of awareness about the dangers of medical experimentation run wild, he says, going back to the Nazi era and also the notorious syphilis study at Tuskegee University in Alabama, where doctors withheld treatment from black men for decades. "Rather than having the starting point being: 'This could be dangerous or this could be risky for people and we need to take that concern uppermost,' " Stevens says. "They start with the premise: 'This is going to be beneficial for China.' "
Wu says his study was allowed to begin after being approved by a single nine-member hospital committee in just two months. He says the committee included a lawyer, a bioethicist, nurses, doctors, a journalist, a representative of cancer patients and a representative of the public. "Chinese patients want to be cured very much," Wu says. "There's a Chinese saying: A living dog is better than a dead lion. So patients are willing to try new cures. That's why the ethics committee and the lab are very positive about this." But the less stringent oversight makes doctors and bioethicists worry that some Chinese doctors may be rushing ahead too quickly, possibly putting patients at risk. "My concern is: Are we really ready? There so much about CRISPR that we don't understand," says Lainie Ross, a bioethicist at the University of Chicago. "We could be doing more harm than benefit. We need to very, very cautious. This an incredibly powerful tool." Ross noted that there are already drugs available that work that harness the immune system in the same way as Wu is trying to use CRISPR. "One concern is: If you could do this with a medication rather than CRISPR, are you actually telling the participants about the alternative?" Ross says. "We have safe and effective FDA-approved drugs that could do the same thing. Are they being informed properly?" "China's like the Wild West," says Dr. Carl June, a University of Pennsylvania scientist involved in the U.S. study of CRISPR to treat cancer that's finally starting after nearly two years of much more intense review than Wu's study in China. The Penn study was evaluated by two federal agencies — the Recombinant DNA Advisory Committee and the Food and Drug Administration — as well as two separate committees at his hospital before getting the go-ahead. "China has made this a very high priority — a national priority to develop this," June says. "There's some very high-quality research in China, and then there are others that are not high quality." June doesn't have any specific concerns about Wu's study and doesn't think the U.S. should relax its safeguards to protect patients. But he worries the U.S. is falling behind like it did at the beginning of the space race. "It's kind of like Sputnik 2.0," June says, referring to the Soviet satellite that became the first artificial satellite to orbit the Earth, shocking the U.S.
"CRISPR technologies have created a Sputnik moment where vast new improvements can occur if we focus on them and make it a priority," June says. "I want it to be done safely. But I want it to be a high priority." And June would like to see a level playing field where researchers around the world follow the same rules. For his part, Wu stresses doctors explained all the possible risks to the patients very carefully before proceeding. And he's already started treating patients with another kind of cancer — cancer of the pancreas. "We [are] just beginning. We should improve it to get more benefits for the patients," Wu says. "If you don't try it, you'll never know." Deng, Wu's patient, agrees, saying he fully understands the experimental nature of the treatment. "I've never worried about this," Deng says. "I believe in science." The new genetic engineering technique known as CRISPR is revolutionizing scientific research and stirring up a whole lot of excitement about new ways to treat diseases. NPR health correspondent Rob Stein recently traveled to China, where scientists are racing ahead of the rest of the world in using CRISPR to treat cancer. STEIN: ...And dance to music blaring from speakers along the waterfront. But Hangzhou's also home to the Hangzhou Cancer Hospital. When I visited early one morning, the lobby was already packed with patients, family members, doctors, nurses. WU SHIXIU: Hi. I am Wu Shixiu. STEIN: Oh, hi, Dr. Wu. 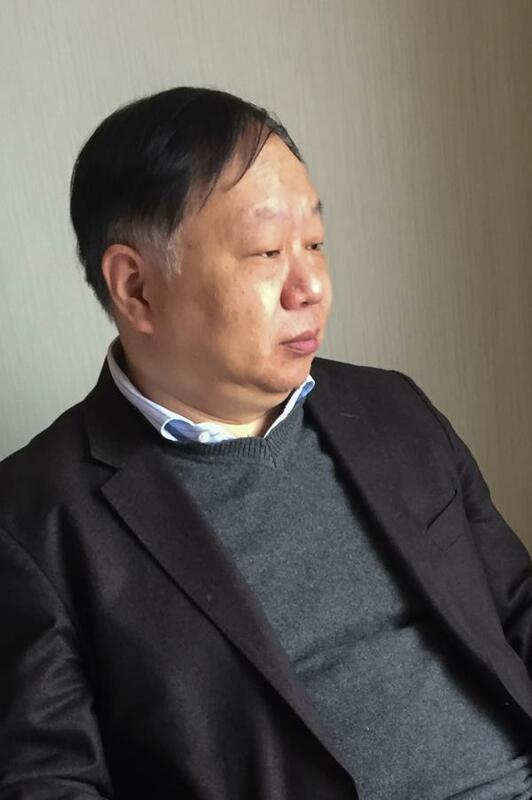 Dr. Wu Shixiu runs the Hangzhou Cancer Hospital and is on the leading edge of using this new gene-editing technique to treat cancer in people. Dr. Wu takes me upstairs to watch as he uses CRISPR to treat one of his patients. CRISPR lets scientists make very precise changes in DNA much more easily than ever before. UNIDENTIFIED WOMAN: (Over intercom, speaking Chinese). STEIN: When we get into the patient's room, Deng Shaorong is sitting up in bed. He's thin and looks frail. Dr. Wu starts asking him questions as a nurse takes his blood pressure. STEIN: Deng's 53. He has cancer of the esophagus, stage 4 - the worst. I get a chance to ask them a few questions through my interpreter. DENG: (Through interpreter) It's over a year now. STEIN: And you went through other treatment first? DENG: (Through interpreter) He went through radiotherapy and chemotherapy both. And then it's not really working, so the doctor suggested this type of treatment. STEIN: The treatment involves Dr. Wu sending some of Deng's blood to a biotech company about two hours away. There, scientists extract key immune system cells called T cells and use CRISPR to edit the genes in the cells. That gene editing unleashes the T cells so they can attack the cancer. DENG: (Through interpreter) He's very excited. He feels like he's very lucky. STEIN: Just then, a nurse rushes into the room. She's cradling a plastic pouch. It's filled with a yellowish fluid. She hangs the pouch from a hook on the ceiling, pulls out an IV tube to attach to the pouch and slides a long needle into Deng's arm. What is that they just brought in? What is that? WU: This is a T cell. STEIN: The immune system cells? STEIN: This is the actual experimental therapy? WU: Yes. And now it's beginning. STEIN: Dr. Wu's patient, Mr. Deng, stares at the needle as millions of genetically-modified immune system cells slowly drip into his body. DENG: (Through interpreter) He can only hope it will get rid of the cancer. STEIN: This is his second infusion. Deng says he started feeling better soon after his first, about a month ago. DENG: (Through interpreter) When he first arrived, he is on a wheelchair. And right now, he feels stronger. He can walk freely. STEIN: Dr. Wu says he's treated 21 patients with advanced cancer of the esophagus and that more than a third have gotten better. One patient is still alive almost a year later. Usually, patients like this would die within months. So it's not curing them, it's just keeping them from getting worse, just keeping them alive. WU: Yes. They have no choice. If they have not received this treatment, they will die - most of them will die in three to six months. STEIN: Three to six months? STEIN: And so far, Wu says, the only side effects have been minor, maybe an occasional fever or a rash. Nine patients did die, Wu told me later, but Wu says that was from their cancer, not the treatment. WU: (Through interpreter) To be a cancer doctor, you see so many deaths. So it's great to use a new treatment to save patients' lives, even if just to prolong their lives a little longer. STEIN: And this isn't the only study doctors in China are doing to test CRISPR gene editing for cancer. China has at least nine studies - for lung cancer, bladder cancer prostate cancer and more. In the United States, only one has been approved, and that's just now about to get going. Why? Why is China so far ahead? I asked Wu about that. WU: (Through interpreter) Chinese patients want to be cured of very much. There's a Chinese saying - a living dog is better than a dead lion. So patients are willing to try new cures. That's why the ethics committee and the lab are very positive about this. STEIN: Wu says it only took a few months for that one ethics committee at his hospital to sign off on testing CRISPR on patients. But that makes some worry that some Chinese doctors may be rushing ahead too quickly. CARL JUNE: So China's like a Wild West. STEIN: That's Dr. Carl June, a University of Pennsylvania scientist involved in the U.S. study. His study went through two federal agencies and painstaking review by two more committees at his hospital before getting the go-ahead. JUNE: You know, China is - they've made it a very high priority. They made a, you know, a national priority to develop this. There is some very high-quality research in China, and then there are some others that are not high quality. STEIN: June doesn't think the U.S. should relax its safeguards to protect patients, but he worries the U.S. is falling behind like it did at the beginning of the space race. JUNE: It was kind of like Sputnik 2.0. STEIN: Sputnik was the Soviet satellite that shocked the U.S. when it became the first manmade object to orbit the Earth. JUNE: CRISPR technologies have created a Sputnik moment where vast new improvements can occur if we focus on them and make it a priority. I want it to be done safely, But I want it to be a high priority. STEIN: And he'd like to see a level playing field, where researchers around the world follow the same rules. For his part, Dr. Wu says his team explained all the possible risks to the patients very carefully. And he's already started treating patients with another kind of cancer, cancer of the pancreas. WU: We just beginning. We just see the benefit to it for patients. We should improve it - more benefits for the patient. STEIN: You want to improve it to get even more benefits for patients? WU: Yes. But if you no try it, you never know. STEIN: You don't try it, you'll never know? WU: Yes. It's my opinion. STEIN: ...He's not worried at all. He believes in science. Rob Stein, NPR News, Hangzhou, China.